A range of lighting products from Aglo Systems was customised for Heston Blumenthal’s restaurant located at Crown Casino in Melbourne. Designed by Bates Smart Architects, the restaurant, Dinner by Heston has come up in the same space where his critically acclaimed pop-up restaurant Fat Duck was once situated. Bates Smart’s design has also reclaimed some of the existing Aglo light fittings at the site. 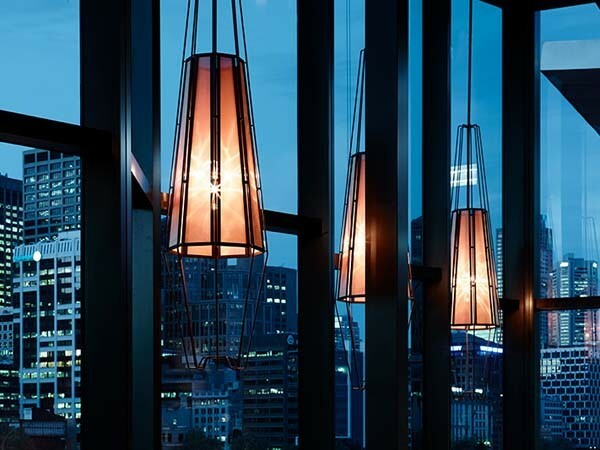 Aglo Systems worked with Bates Smart and Crown Melbourne to design and manufacture unique pendants and table lamps for the custom restaurant lighting project. The complex designs were hand-crafted to beautifully complement the environment. While the pendants were manufactured from delicate bent rods using precision welding and designed to hold the fine copper mesh with no visible fasteners, the table lamps were created using press fits and magnets to avoid fasteners. Both the pendant lights and table lamps were electroplated to a bronze hand-brushed finish.